The Arctic plays an important role in the global climate system, and it warmups faster than the whole Earth. Scientists from the Institute of Atmospheric Physics(IAP), Chinese Academy of Sciences, analyze the in-situ air temperature at Ny Alesund (78°55'1.2N, 11°55'58.8E), where the Chinese Arctic station Yellow River locates and warns the fast warmup in the Arctic, but also points out this February isn't the warmest there. The IAP team finds this region has the fastest warmup in the Arctic, and highest temperature in the recent warm wave. 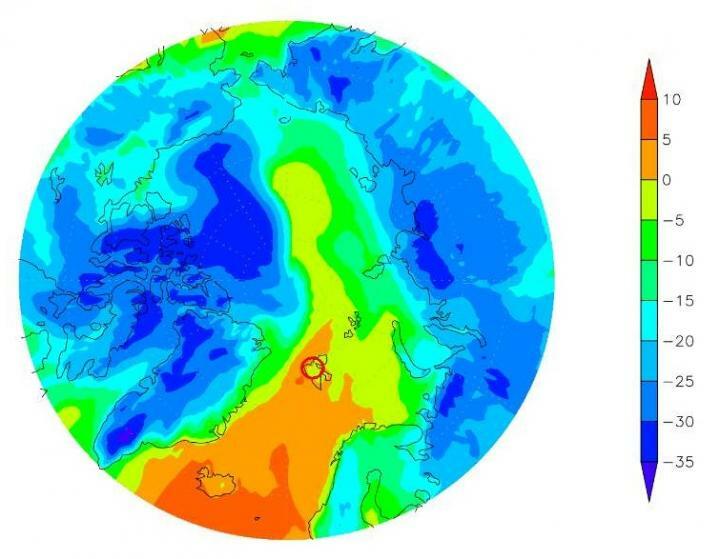 The analysis shows the daily mean temperature (DMT) reached 3.3 degrees C, with a maximum temperature of 4.4 degrees C, on 26 February, 2018, much higher than the other regions of the Arctic and even the lower latitudes. According to the annual report of National Oceanic and Atmospheric Administration of USA reported by the media, "The Arctic saw the warmest temperatures ever recorded in 2016". However, this is not the highest DMT in the historic February, according to the IAP team. The DMT at Ny Alesund has the record of 3.5 degrees C, and a maximum temperature of 4.9 degrees C on 5 February, 2017. The analysis warns a rapid warmup in February at Ny Alesund, and the highest DMT in February has increased 11.1 degrees C since 1998, with a trend of 3.2 degrees C in every 10 years. In recent 10 years, the highest DMT in February exceeded 0 degrees C 8 times, possibly related to the change of the north Atlantic current. IAP has started an observation campaign at Ny Alesund since June 2017 and will use lidar and UAV to detect atmospheric processes in the region.